The one life saver in the closet all year round - is the black leather jacket. A classic and timeless piece, that truly works with everything. It's the perfect jacket for a summer night, fall shopping spree or a chilly winter coffee - it's all about how you style it to make it work. To prove that to you we have teamed up with Zalando and here is our 3 ways to style the leather jacket! The casual look is always the most useful one according to me, it works great in the everyday life and shows your personality in style. I would wear this look to meet with friends, run errands or as a travel attire. Super comfy and simple, but still chic. So some things to think about; it should be comfortable, pieces with minimalistic design and clean additions when it comes to accessories. The business look can be kind of tricky, depending on what type of job you have or what business situation you are facing. In our daily work we go on a lot of meetings with different partners, PR agencies or showrooms - but we are both based in an office most of the time. Some guidelines to keep in mind; to always wear clothes that covers most of the skin, some more elegant materials such as silk gives a more proper approach and the perfect medium sized bag to fit all you need for the business day. The party look doesn't really have any rules or guidelines, you can really go crazy on this front. But some must haves for us is definitely sequins, colors or patterns - maybe some cut-outs or weird designs. I usually pick dresses or skirts for parties and events, since I almost wear pants everyday for the other two above categories. It feels even more festive that way, to save it for special occasions and fun happenings. High heels, colored lipstick and fun accessories are also some musts for a party look - but maybe not all at the same time. This look is a signature for winter parties, since it's so cold in Sweden right now. It would have been great with a high ponytail as well! Hope you all enjoyed the styling tips and next up will be 3 ways to style the... white shirt! Stay tuned next week. 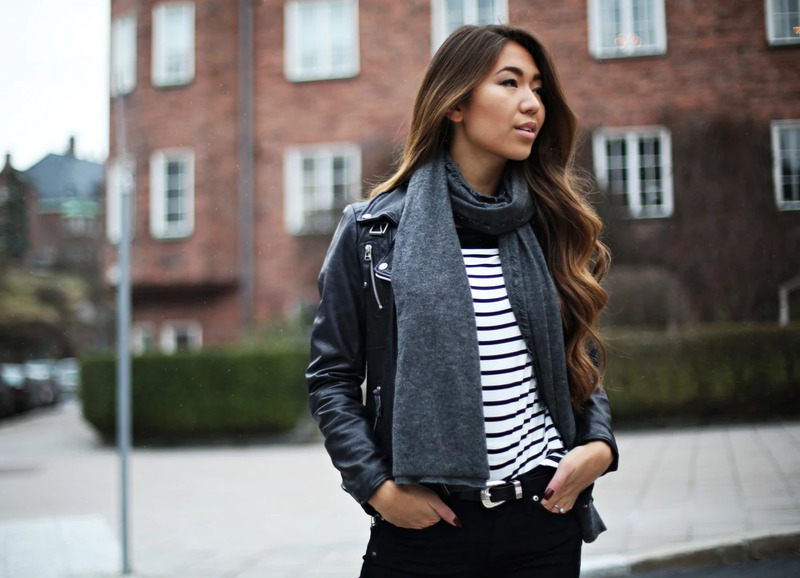 And don't forget to watch Zalando's own styling guide for the black leather jacket, you'll find it below!